In high school and during my freshman year of college, I had a lot of trouble dealing with stress. Triathlon was always a means through which I helped to manage my stress, but at times it began to take a toll on my body without me realizing it. My stomach condition became worse as a result of my stress (even though it took me years to realize this). I was happy – with great friends and family around me, awesome friends, and more – but at times my preoccupation with things and stress would cause be to become quite upset. Which became draining. I realized that stress is normal – but not when it’s happening too often for too long. This summer, I decided to work on making a permanent change. To stress less. To take things as they come – and realize that little speed bumps along the way aren’t the end of the world. I noticed a huge difference in my life as a result of this. The happiness I had once felt on a daily basis had exponentially increased – I felt as if I was constantly walking around with a bounce in my step and a smile on my face (and inside). I learned that true inner happiness and lack of stomach-wrenching stress is a process; a collection of emotions from varying facets of your life as well as an underlying DECISION to be happy. 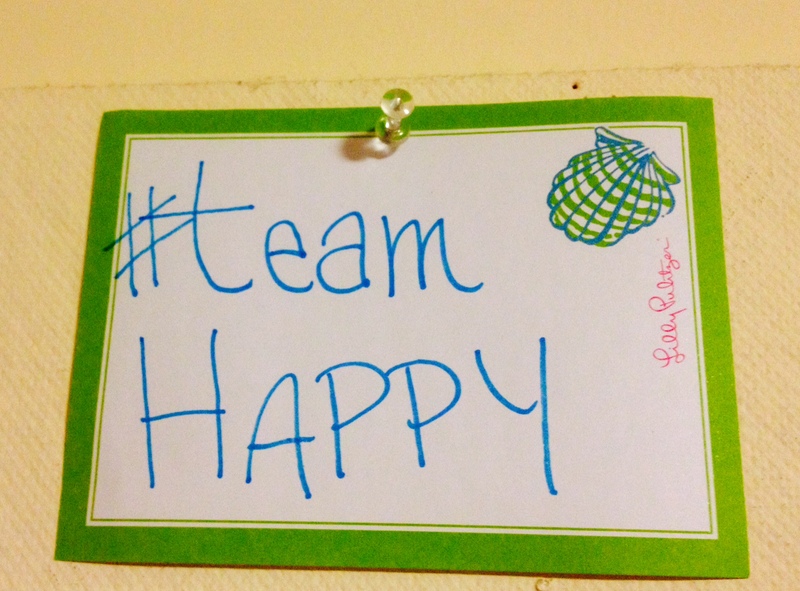 My friends and I even came up for a name for our new way to approaching life: #teamhappy. It didn’t mean that we had to be outwardly happy ALL the time, but it means that we have an inner content ness with how our life is at the current moment. This “high on life” feeling lasted quite a few months. 🙂 But as with any highs, lows at times come. Finding myself more stressed over the past week or so, I noticed a change in the way my stomach felt. In my mood. In my organization. In the way I felt about everything. Part of this has to do with the fact that my foot injury has dragged on for over a month – and I haven’t been able to use workouts as a stress reliever. We have a saying this year for our crew team – “Don’t let the highs get to high or the lows too low.” And that’s what I — and you — should make sure that you do. Hit a high in life? Enjoy it. Savor it. But keep an inner calm. Hit a low? Breathe. Know that it is just a speed bump and things WILL be okay. Because when it comes down to it, being happy is truly the most important thing in life. Have you felt especially stressed lately? How do you deal with it and try to stay #TeamHappy?